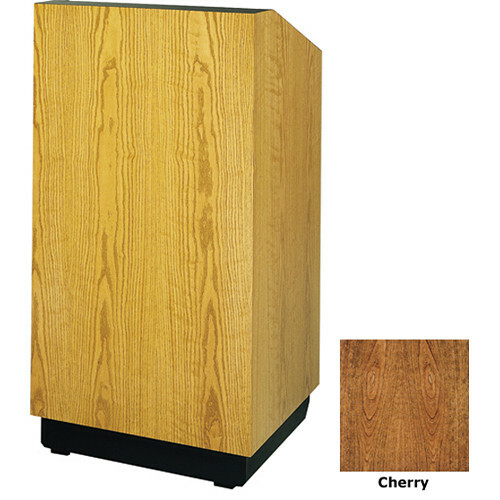 The cherry laminate Lexington 25" Stacking Lectern with Sound System from Da-Lite offers you two options for your presentations. Use it as a full-size floor lectern or separate it giving you the top half for a table top lectern and the bottom half for a projection table. The top half has a high-intensity reading light, 70W speaker system, removable microphone with gooseneck mount, and LED clock/timer with countdown capability. There is also an aux line as well as lines for mic in/out. The reading surface is spacious enough for a 3-ring binder. A power cord supplies electricty to the top half while the lower portion has built-in 110-125V, 50/60 Hz receptacles. A major advantage of this design is that it saves you the expense of having to buy two pieces of A/V furniture. And, the two non-locking casters give you the option to move the lectern to the venue of your choice. The rectilinear design with flush panels, square corners and cherry laminate wood finish gives the Lexington its clean professional appearance.